Gray Days Are Beautiful Too! During summer season the area in which I live is a tourist mecca. We have abundant waterfalls, thousands of lakes, and rivers and streams galore... but the granddaddy of them all is the shores of Lake Superior. tourists come in droves during the warmer months, but during the dark cold gray season of winter, the shores become our own private playground. The weather conditions are not for the faint of heart... but to tell you the truth, I find the beauty far exceeds that of the warmer months! 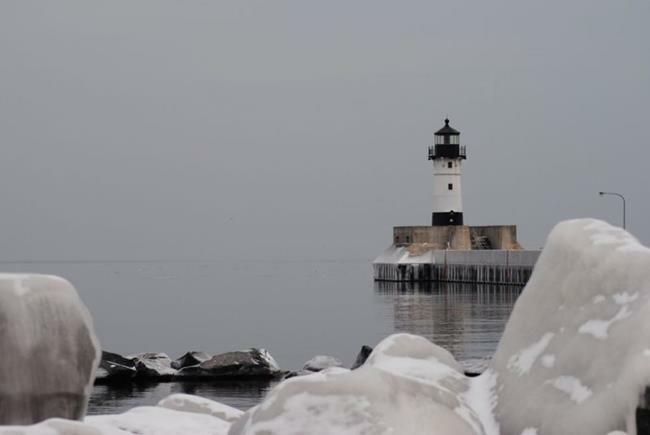 Duluth Minnesota, lighthouse and ship canal, complete with icy rocks.